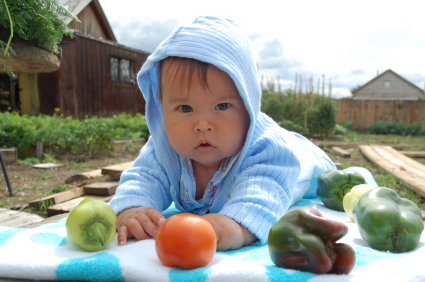 Your baby is getting more mobile. First rolling and now sitting. Perhaps he's pulling up; rocking or attempting to crawl. Whatever he's doing though he's into everything. Out goes the hand to grab and into the mouth it goes- quick as a shot. You've tried the plastic toys and the electronic toys... Whilst they've had some success they hold his attention for only a short time before he's off again searching,looking, touching, moving. He enjoys the natural toys but you have only a few. It's hard to keep them happy they seem bored and distracted . because babies are sensory seekers with mouthing and touching being their favourite sources. Their play environment is often primarily plastic. Plastic tastes the same. Imagine your water bottle left out in the sun, full of warm water that tastes like plastic. Unsurprisingly, the plastic toy tastes the same. Electronic toys are brightly coloured with different patterns, shapes, and textures. They have repetitive music on a loop, all in the same toy. But they all work well with a push or a bash, there's no chance for discovery. They are more toy than the child using it. "I'd never heard of a "Treasure Basket" beforehand but after reading all about them I was eager to try it with my daughter. She loved banging some of the hard items on her tray to experience the sounds they made. She also seemed very intrigued to just study the objects turning them all around in her hands or poking them with her index finger. It wasn't too difficult finding the objects." "I would get the "Treasure Basket" out a couple of times per week or when my daughter seemed bored or I needed her to be still and busy in her highchair. I always enjoyed watching her explore the "Treasure Basket" objects. I soon learned to find other things to add to her "Treasure Basket" play, and always was pleased with how eager she was to explore her world." "We adapted the Treasure Basket idea on a recent trip with our 7 month old. I dedicated one pocket of the backpack I brought to treasure basket items to entertain Elli during our long flights and drives. I was collecting all the non-toy, natural items I could find and my husband asked why I was packing such random things. I explained they were to entertain Elli and he jumped on board also searching around for items. We brought an old CD, a plastic insurance card, an unfinished crotchet project, spoons, keys, a variety of key chains, a hat, and so on. Anytime we were waiting somewhere, I put the backpack by her with that pocket unzipped. She quickly figured out how to reach in and pull out new objects. We even had a few opportunities to share out treasure basket with other children waiting at the airport. Elli loved watching other kids play with the objects and those parents appreciated fresh "toys" for their kids to play with." "I really enjoyed this e-book about treasure baskets because Elli is starting to tire of the contents in her basket and Melitsa's book contains great ideas for items to add to the treasure basket. I hadn't considered food, kitchen utensils or wrapping paper, to name a few, and I'm looking forward to incorporating these new ideas into our play routine." 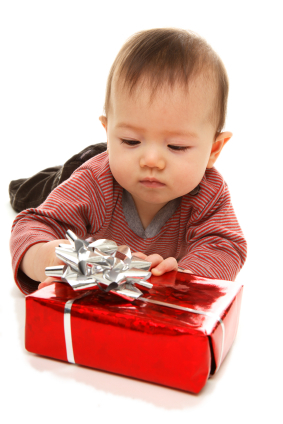 Treasure Basket Play shows you step by step how to effectively and safely set up and use a treasure basket in your home today that will engage and challenge your baby each time they use the basket. Saves you time with the ready made lists of objects and ideas to build on. Gives your child rich learning experiences with planned creative play activities. Ample opportunities for independent decision making- rare chance that your child controls the environment. Learn about the power or heuristic play model and the knock on effects on their creativity and imaginary play. 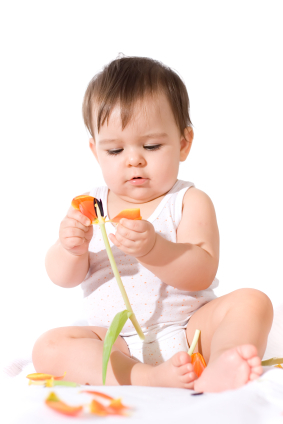 Provides developmentally appropriate play activities for your baby that are educationally sound and don't expect one way of playing. Naturally transitions from Treasure Basket to Heuristic play explained with examples to continue the play model. Play activities are suitable for home, daycare, playgroups and playdates with easy to follow instructions. 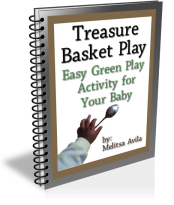 Download for instant access to "Treasure Basket Play" 27 page pdf e-book on "Taking you step by step through the process of natural play"
The e-book includes: Choosing the right basket, adding the objects and playing with your child. Includes notes and resources for further study and reflection . 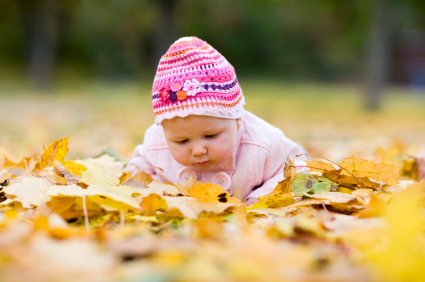 Are you ready to have fun playtimes with your baby? Yes, Melitsa. I want to buy "Treasure Basket Play" and receive the free bonus interview and case studies so I can create my own treasure basket. Your privacy is protected and your email address will only be used by me to communicate with you about Treasure Basket Play related subjects. Melitsa Avila is a military wife and busy mom to three young boys. She's a former primary school teacher. She started Play-Activities.com, a free play activity weekly email for children under 5 after having her first child. She's passionate about empowering parents to engage in practical play activities that cover all the developmental areas at home without having to buy special onetime use products, flashcards or electronic equipment;just like it used to be. Melitsa is an advocate for keeping the under 5s playing creatively everyday materials moms will find in their homes using educational and fun activities. It's amazing how everyday object such as: wide open space, pine cone, marching song, colorful scarf, yarn, pudding, cereal boxes and paper can be put to so many playful age appropriate experiences....you'll be amazed too! (C) Copyright 2009 Melitsa Avila All rights reserved. The information that is represented on this site and in the downloads in represents the view of the author as of the date of publication. These resources are for the purpose of information only. The information given in these resources are provided to aid the reader in their decision making process but is not intended to be held legally responsible for your success or failure in the areas of play, socialisation or development. It is merely a tool by which you can learn and grow. If advice concerning legal, special needs or professional matters is required, please consult the services of a fully qualified professional in the first instance. While every attempt has been made to verify the information provided in this report, neither the author nor his affiliates/partners assume any responsibility for errors, inaccuracies or omissions This ebook and the subsequent downloads in this series are not intended as a source of legal or professional advice. All activities require full supervision with an adult present. Please remember that each individuals success depends on his or her background, dedication, desire and motivation.